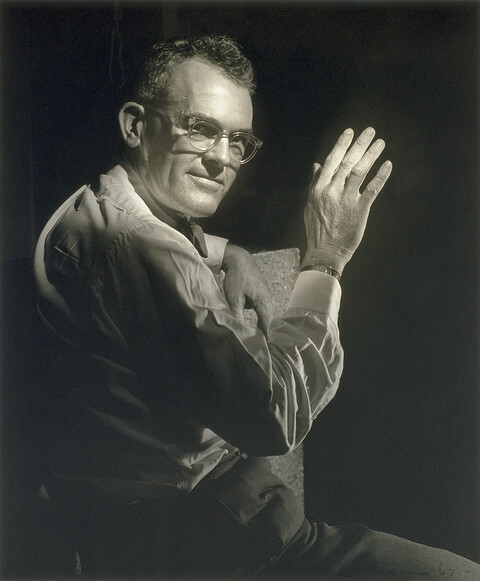 Hal Missingham AO (1906-1994) 1947 by Max Dupain (1911-1992), gelatin silver photograph. Collection: National Portrait Gallery, Canberra. Gift of Rex Dupain 2003. Born in Claremont, Western Australia, Missingham was educated at Perth Boys’ School, and later undertook an apprenticeship to the process engraver J. Gibney and Son in 1922. He studied drawing at Perth Technical School, attended art schools in both Paris (1926) and London (1926–>1932). From 1927 to 1928 Missingham worked in Canada as a freelance artist and teacher. Before World War II he studied in Perth, Paris and London, where he became friendly with a number of leading artists and developed an interest in photography. He worked at a number of studios in London, was apprenticed for five years to a blockmaker and taught commercial art for six years at the Central School of Arts in London. He returned to Sydney in 1941 and after serving as a Signalman in the Second Australian Imperial Force helped to found the Studio of Realist Art. In 1945 he succeeded Will Ashton as the Director of the Art Gallery of New South Wales, a post he retained until 1971. Amongst his myriad roles was the design of the Gallery’s catalogues, and he developing a distinctive two-colour system for the covers linked to each exhibition. Missingham also re-designed the Art Gallery stationery down to the smallest detail, bringing it into line with modern ideas. As a designer, he was associated with Paul Beadle, the sculptor, and Roy Jenkyns in the production of a series of Berger’s diaries. Missing ham also drew a noteworthy series of covers for Australian National Journal when it was published in a pocket size. He also designed innumerable book-jackets, including his own books. He oversaw the expansion of the gallery including the construction of the Captain Cook Wing from 1968 to 1970. His collection policy made an outstanding contribution to Australian contemporary art and he was responsible for bringing a number of influential international exhibitions to the country. His memoirs, They Kill You in the End, were published in 1971. Missingham was appointed an Officer of the Order of Australia on 26 January 1978 for service to arts, particularly as Director of the Art Gallery of New South Wales.